According to some old traditional believes, it is been said that the birth of Lord Krishna was on purpose. He was considered to be the destroyer of all evils and thus the creator of love and passion on the surface of earth. Thus the sudden disappearance of the Lord was indeed questionable to all for none was sure of the fact what actually lead to the sudden desertion. Listed below are some of the reasons that might pose as a reason for the His disappearance. Once you go through you will definitely be able frame an idea, what was the actual reason. And if you find this article was indeed of great help, then click here to send this page to your friends so that they can as well know the reason behind the disappearance of the Lord. Lord Krishna, the 10th incarnation of Lord Vishnu, took birth on this earth with a purpose. His sole objective of taking human form was to cast away all forms of evil and cruelties from the Earth and bring in prosperity happiness and love. According to some old beliefs it is said that Lord Krishna lived on Earth with his brother Balram for a span of 125 years. The first ten years of his life were spent in the towns of Gokul and Vrindavan, in Northern India. 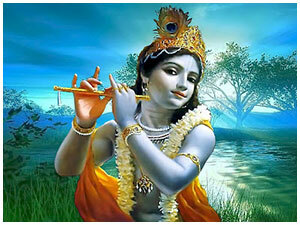 Then from his 11th year till he was 28, Lord Krishna lived in the land of Mathura. Soon he established Dwarka, a city in Gujarat and lived there for the rest of his life with his wife Rukmini and sons. The birth of Lord Krishna in the guise of ordinary being was on purpose, for His sole intention was to eradicate every kind of cruelty and evil power from the soil of earth. He wanted the Mother Earth to be free from brutality and vices. Soon this primary objective of His was superseded with a secondary motive which was to fight the historical battle of Kurukshetra so that true justice can be delivered to the Pandavas. Thus having accomplished his missions, it was time for the Lord to end his life journey on Earth. Another significant reason for the disappearance of the Lord from his earthly abode might be the curse of Mother Gandhari. According to the stories from Mahabharata, the historical battle fought in Kurukshetra resulted in the death of all the hundred sons of King Dhritarashtra and Gandhari. So in order to offer his condolence to Mother Gandhari, Lord Krishna went to meet her but returned with volleys of curses. For he was cursed that just as the Kaurava dynasty ended fighting killing each other, similar outcome Yaduvanshi dynasty must face, for Mother Gandhari felt that Lord Krishna didn't play a fair role in putting an end to the war. Lord Krishna accepted the curse gracefully. Another renowned folklore that seems to hold responsibility for the disappearance of the Lord is the story of Sage Vishwamitra and Sage Narada. For according to some famous epical tales it is said that once Sage Vishwamitra and Sage Narada visited the city of Dwarka to meet Lord Krishna. A few children of Lord Krishna dressed up Samba (the son of Sri Krishna and Jambavati) as a pregnant woman and asked the visiting sages to foretell as to what kind of a child Samba will bear. Feeling insulted, the sages cursed that Samba will give birth to an Iron rod which in turn will be instrumental in the fall of the Yaduvanshi Dynasty. The very next day, Samba gave birth to an iron rod but soon the rod was crushed to powder by Lord Krishna's sons and was thrown in the sea put in a bottle. However, one day the bottle was washed up the shore and the powdered iron took form of an arrow. Lord Krishna could foresee everything and as a last resort to save his Dynasty, prohibited liquor in the city of Dwarka. But to his disappointment the Yadavas became drunk and killed each other with iron rods. None of them survived. Thus the Dynasty perished along with Lord Krishna’s hope and aspirations. Another valid reason for the sudden disappearance of Lord Krishna can be the death of his elder brother Balram. For there are stories which tells us as to how Lord Balram the elder brother of Sri Krishna sat under a tree and ended his life by breathing out life from his mouth in the form of a white serpent after seeing the end of Yaduvanshi clan.